In 1920, an American engineer, Claude Allen Porter Turner (CAP) designed two different bridge designs that were supposed to simplify the way bridges are constructed. The first was the Turner Flat Slab, a design where the decking portion of the concrete slab was strengthened, thus eliminating the need of extra piers and it would encourage the spans to be longer than usual. The second is a modified version of the Warren truss, where additional lateral beams are constructed midway through the A-portion of the truss, thus creating an A-frame for each panel. Both of these concepts were practiced on the Liberty Memorial Bridge in Bismarck, North Dakota. 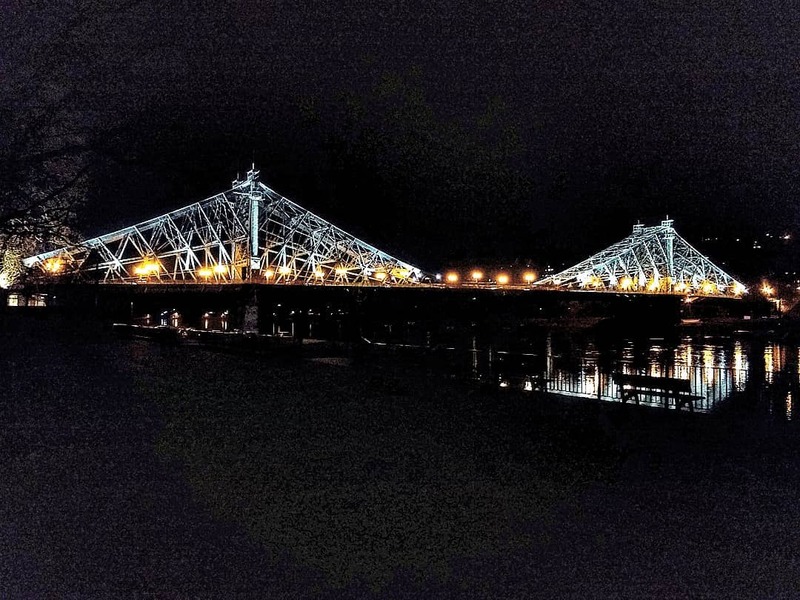 Constructed in 1922, the bridge featured three Turner through truss spans of 476 feet each, plus the Turner flat slab approach spans totalling 1105 feet- 625 for the west spans and 480 for the east side. It was the only known work for the engineer, whose career started at Gillette-Herzog Manufacturing in Minneapolis in 1900 but then started his own business after declining an offer to relocate to Chicago. The product of the American Bridge and Foundation Bridge Companies remained in service until its replacement in 2008. It was believed to have been the only one of its kind built…..
…..that is until this recently discovery in Chemnitz, Germany! Located just two kilometers south of Chemnitz Central Railway Station along the Dresden-Hof-Nuremberg Magistrate at Bernhardstrasse, this pony truss span resembles the same Turner design as the Liberty, but with two unique differences: 1. The truss span is pony and 2. The endposts are vertical. Like the Liberty, the connections are riveted, even in the A-frames of the Warren. Yet some unique features of the truss include the curled cap at the top of the endpost. The end post itself has an I-shape. It is unknown what the length of the bridge is, but it is estimated to be between 60 and 70 meters long. The width is 10 meters between the trusses, the sidewalks on the outer edge is 2-3 meters, thus totaling the width of 16 meters. As the East German government built or imported truss bridges during its 40 years existence, whose designs were mainly Warren (and many modified versions of it) and had not much design to it, it is likely that this bridge was constructed during the 1920s, maybe the 1930s, and survived the bombings of Chemnitz during World War II. 90% of the city center was destroyed by 1945 and 70% of the houses and buildings, dating back to the 1800s were either in shambles or badly damaged. This bridge may have survived the bombing unscathed. Yet the lack of scars from the war might lead to a dispute over the bridge. It may have been rebuilt using replacement parts, but most likely in the late 1940s to encourage passage over the magistrate. If that was the case, then the bridge was built before the Soviets gained full control of its militarized zone, which became the German Democratic Republic (a.k.a. East Germany), while Chemnitz was renamed Karl-Marx-Stadt, a name that remained on the maps until German Reunification in 1990.
Who designed the structure? Did this engineer use the Turner design or was it just simple coincidence? Lastly, if this bridge is considered a Turner truss, are there other designs of its caliber that exist? If so, where? What do you know of this bridge, let alone the Turner truss? Share your thoughts either on facebook page or by using this contact form. A tour guide on the bridges in Chemnitz is in the making and if there is enough information, this bridge will be added. Let’s see if we can solve this mystery surrounding this bridge, shall we?